A-Frame Signs. LJMDesign Provides Quality Printing, Signs and Websites. Cairns and Townsville North Queensland. 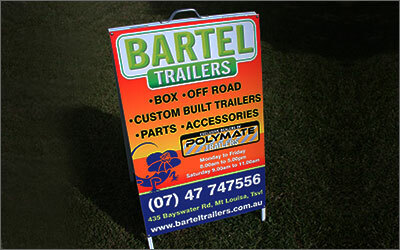 A-Frame signs are easily transported, handy to put in and out every day to show your open for business! LJMDesign can design these to promote your services or products, current specials or just your trading hours. ➜ A-frames come in 2 main sizes, smaller 600x900mm and larger 900x1200mm. ➜ There are 2 types of A-frames, metal face or corflute slide in option.